I will be on vacation the rest of the week and most likely will have no access to a computer. This graph from John Cole shows very clearly how insane the conservatives are who claim that Obama's meager tax increase on the very wealthy is going to drive us to socialism. The period between WWII and about 1973 was known as the Golden Era of Capitalism. 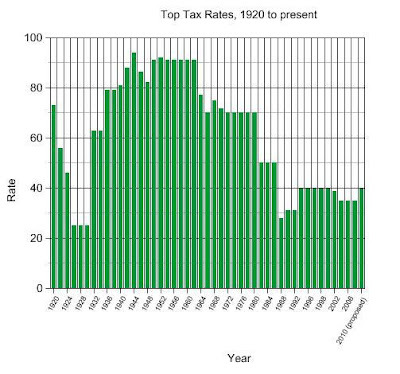 At no time during that period was the top tax rate lower than 70 percent. And yet, the economy grew like gangbusters and we became the most powerful nation on the planet. Amazing, isn't it.